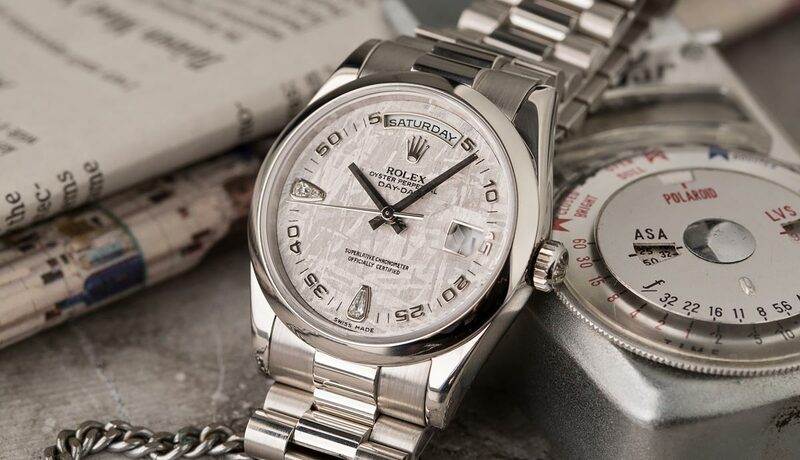 Most Rolex watches are instantly recognizable thanks in part to the brand sticking to certain design standards, whether that’s the case size and shape, bracelet type, and bezel style. On the other hand, Rolex watch collections are also varied and that’s mostly due to the abundance of dial options available to the consumer. Along with standard colored metal dials, Rolex also has in its catalog some very interesting dial materials such as semi-precious stones and even space rocks! Today we take a look at an intriguing Rolex Day-Date furnished with a meteorite dial. 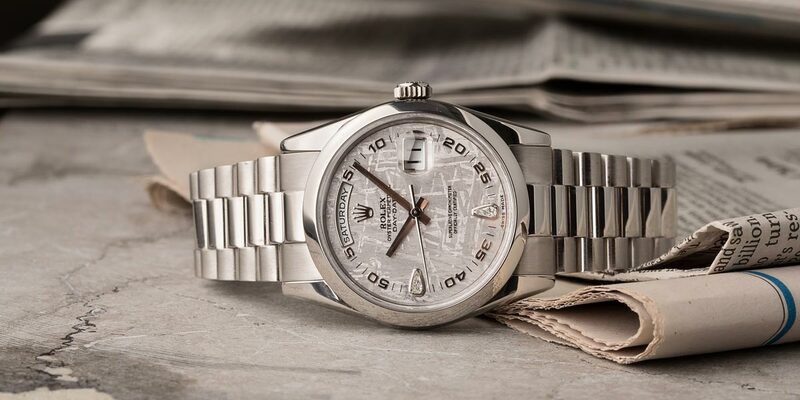 The Meteorite Dial by Rolex is a watch that holds a diamond dial, and of course, it is on a Platinum Day-Date. To create their meteorite dials, Rolex uses material from the famed Gibeon meteorites. Named after the Namibian town it was found in, the Gibeon meteorites fell to earth during the prehistoric times, covering an area stretching 171 miles long and 62 miles wide. The indigenous Nama people had been using the meteorites to create tools and weapons for generations and in 1838, English explorer James Edward Alexander came across the material during his travels. He sent some samples back to London where renowned scientist John Herschel confirmed their extraterrestrial origins. 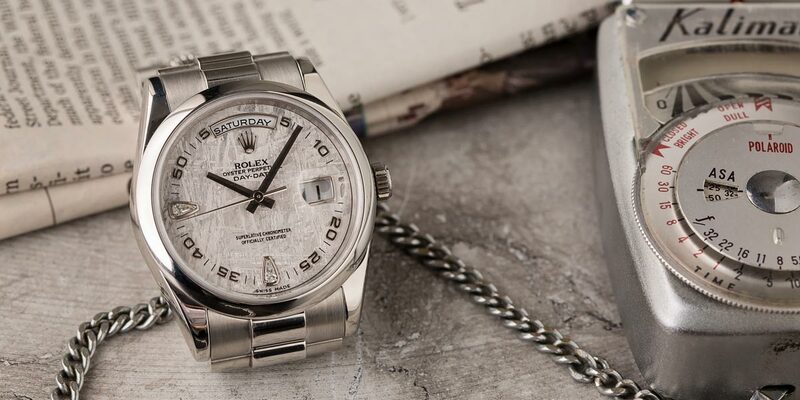 Particularly cherished for its crisscross-like Widmanstätten pattern, Rolex treats the Gibeon meteorite material with an acid wash to emphasize its design prior to making the dials. The meteorite dial on this Rolex Day-Date 118206 adds a captivating look and fascinating texture to any Rolex watch it is used in. Today, strict Namibian laws protect the meteorites, thus these famed rocks can no longer be taken from where they lie. The Rolex Meteorite Dial Day-Date is a watch that has extraterrestrial material within its construction. One particular model that Rolex showcases these rare meteorite dials is on the ultra-prestigious platinum Day-Date ref. 118206, which is still a part of Rolex’s current catalog. This Rolex President features a 36mm case, smooth domed bezel, and (naturally) the famous President bracelet with semi-circular links. While this watch stands at 36mm, don’t let the size fool you. What are your thoughts? Comment below. Perfectly complementing the white metal of the Day-Date’s case and bracelet is the silvery meteorite dial, flaunting that prized Widmanstätten pattern with the Gibeon meteorites. On that dial, we see the characteristic date window at 3 o’clock—magnified by the Cyclops lens on the crystal—along with the full day of the week displayed on the window at 12 o’clock. Interestingly, rather than hours, there are Arabic numeral minute markers, further accompanied by a duo of diamond indexes at 6 and 9 o’clock. The Day-Date 36 ref. 118206 runs on the Rolex Caliber 3155 automatic movement with 48 hours of power reserve. It simply doesn’t get much more precious than a Rolex President made from platinum, diamonds, and meteorite! What do you think of the meteorite dial? Do you like its pattern? Sound off in our comments section below.